GlazeTeach - Fully available now. GlazeTeach is an interactive application designed at the School of Art, Otago Polytechnic, Dunedin, New Zealand to teach ceramic students the basic principles of glaze chemistry. Many schools and individuals have found GlazeTeach a useful tool to assist in the teaching of glaze chemistry basics. In response to requests from current users of GlazeTeach to release the software as a seperate package you may now purchase a single copy of this popular teaching aid. The software is html-based which means that it will function on all computer systems including Windows and Macintosh. 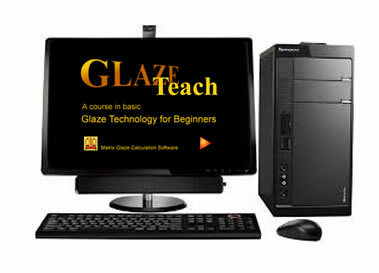 NOTE: Currently you may obtain a free copy of GlazeTeach packaged with a Matrix purchase. GlazeTeach comprises seven units of study each building on the knowledge gained in the previous unit. In each unit the course covers a number of teaching principles then the unit shifts into a question mode posing a series of questions with four multiple choice answers to choose from. Choosing a correct answer will take you to the next question and ultimately on to the next unit.